Oster Versa Performance 1400-Watt Blender is a blender usually referred to as a Vitamix clone. And it is quite easy to understand that. Like the Cleanblend , the Oster Versa also take some design cues from the Vitamix (specifically the Vitamix Professional Series 750 ). On top of the similar design, it also comes with a high powered 1400-Watt motor. But as with the Cleanblend, a high powered motor is not the only deciding factor for a blender. Let’s get on to the review and find out if the Oster Versa is a worthy blender or not. 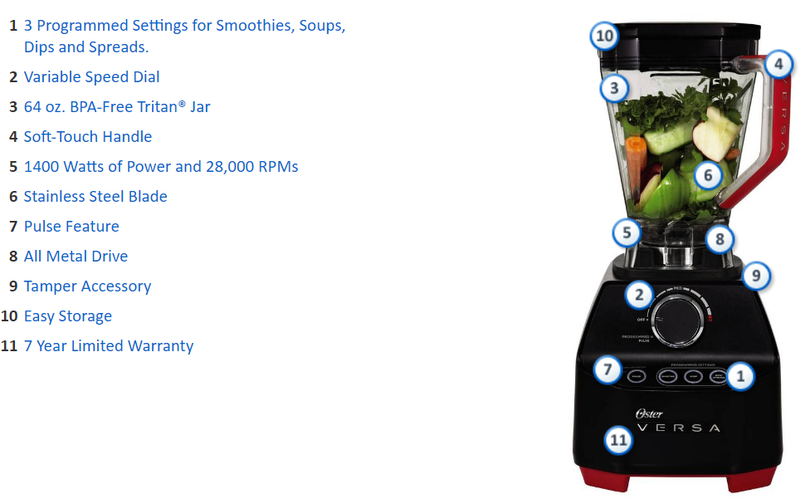 Function: 10 Variable speeds, Pulse function and 3 Programmed settings: Smoothie, Soup and Dips/Spreads. The Oster Versa really looks like the Vitamix Professional Series 750 . The wide bulky base and the stout jar makes them look the same. 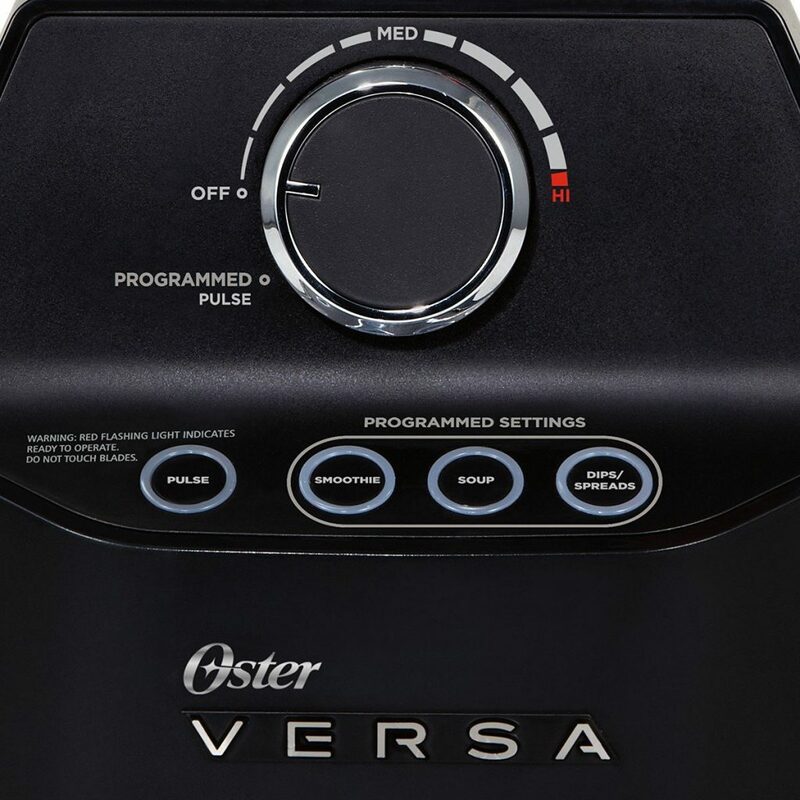 Some people say the Oster Versa is a copycat and shy away from it. But for me, if Oster managed to copy the good things from Vitamix, and produced a cheaper high performance blender, why not? At the end of the day, we are the one that benefited from it. After all, the design of the Vitamix is not patented (as far as I’m aware) and there is no restriction for any company to produce a blender with the same design. But the stout jar and the bulky base are not the only things that are the same. The Oster Versa also has a 1400-Watt motor, almost the same as the Vitamix that has 1440-Watt motor. And that’s where the similarity ends. The Oster Versa has a brilliant and beautiful black/red color scheme. The red soft touch handle for the pitcher looks pretty indeed. The glossy black base lends some elegance, while making it easy for cleaning. On the control panel, there is a circular knob at the center to control the variable speed of the blending. There is also a Pulse button as well as 3 programmed setting buttons: Smoothie, Soup and Dips/Spreads. As a comparison, the Vitamix Professional Series 750 has 5 programmed settings (smoothies, frozen desserts, hot soup, purees, self cleaning cycle). The Oster Versa also has a serrated blade compared to the sharp blade of the Vitamix. Above is a video comparison between the Oster Versa and the Vitamix Professional Series 750. The test is the apple test where an apple is fed into them and blended as a whole. During blending, we can notice that the liquid in the Oster Versa moves at a slower speed than the Vitamix. At the end of the test, the Oster Versa blender has a less smooth blend than the Vitamix. Now, how can this happen? Sure, the Vitamix has a bit higher wattage, at 1400-Watt but the extra 400-Watt is not that much. My take is that even though the Oster Versa blender has the same motor power, its efficiency and overall blending mechanism is lesser than the Vitamix. Will You Really Get The Whole 1400-Watt Power From The Blender? To answer this, I have to explain that the 1400-Watt rated motor comes from the electrical power i.e the input electrical power from our electrical plug. The electrical power equals to Voltage multiply with Current (Electrical Power = Voltage x Current). This is the rated power that all blender advertised. But then during blending, the actual power will be lesser than this value. Actual mechanical power is torque multiply with rotational speed (Mechanical Power = Torque x Rotational Speed of Blade). For example if we put a big chunk of metal into the blender, and start blending. The blade will stuck and won’t move so the actual blending power that we get is zero. So the mechanical power is dependent on what type of things that we blend. All motor also has an efficiency. Some of the input power will be loss due to friction that generates heat in the motor and the blade assembly during blending. As such, the efficiency of the motor also pays a huge role on blending performance. From the real life performace test from the video above, I strongly believe that the Oster Versa blender has a lower efficiency and lower mechanical power output than the Vitamix Professional Series 750. Not to mention the blade of the Vitamix is slightly bigger and longer that would definitely improve its blending performance. The Vitamix with its almost 70 decades of experience in blending technology definitely has lots of upper hand in designing a high performance blender. Is The Oster Versa A Good Blender Then? Sure, the Oster Versa lose to the Vitamix but then I need to remind that it did blend a whole UNCUT apple. Now that is a feat that most blender can’t do, except for the best blenders out there. It might not have the Vitamix’s quality in blending, but it really goes up to that high performance standard. Most reviews from users also give tips that we need to blend any smoothie for a bit longer with the Oster Versa to give a smoother delicate smoothie. It is not as good as the Vitamix but it certainly is a high performance blending machine, at half the price too! Below are some of the pros and cons of the Oster Versa Blender. Who Is It For: Those looking to have a near professional blending machine and experience, at half the cost. Looking For A Cheaper Alternative? 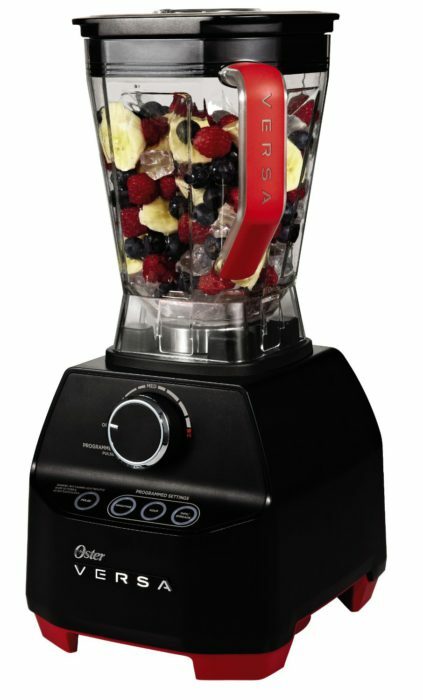 The Oster Pro 1200 is another good blender from the company at only $90. 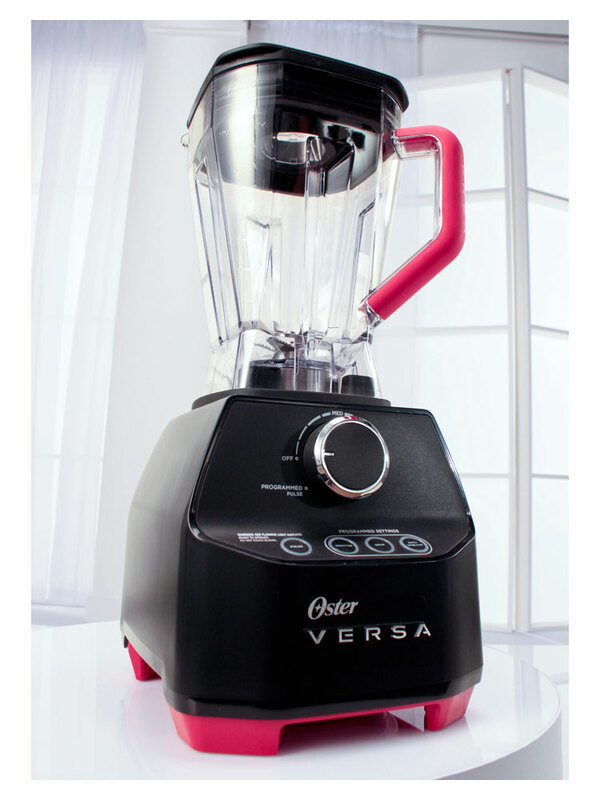 The Oster Versa is a powerful blender with its 1400-Watt motor. At its price, it is one of the cheapest high powered blender along with Cleanblend also at $200 (though the Cleanblend is more powerful at 1800-Watt). But both of them cannot possibly compare against the heavyweight of the blending machines such as Vitamix and the Blendtec . Both of them are top of the line, and designed for the harsh usage in a restaurant or cafe. But, if you can live with a pseudo-professional blender at half the price, then the Oster Versa is the perfect choice for you. Looking to buy the Oster Versa Performance 1400-Watt Blender? Click the link below to see the latest deals on Amazon. What an excellent review, I was absorbed by the reading! It’s been a while now that I am looking for a quality blender. The Oster look of a great quality and the price is not that high, plus there is free shipping, great! You have given all the information needed for the blender that there is almost no question left to ask, except one! Do you ship out of US? Hi Daniella! Glad you like the blender. The Oster Versa 1400 is definitely a high powered blender with a much affordable price than the others. On the shipping, I believe the Amazon seller can ship outside of US. But then you will need a converter as the blender is built to American electricity spec. Hope that helps Daniella. Let me know if you need anything.